A live recording made in Paradox in Tilburg in October 2007. Over the past twenty years one of the bigger enigma's of 'industrial' music or 'modern musique concrete' has been THU20. They seldom record or play live, yet when they do, a lot of attention is placed on the detail. In the studio this leads to perfectly shaped sonic constructions, and in a live concert a detailled balance between the various interests of the five players involved. The computer work of Jos Smolders and Roel Meelkop, the acoustic sound objects of Peter Duimelinks and Frans de Waard and the analogue electronics of Jacques van Bussel. 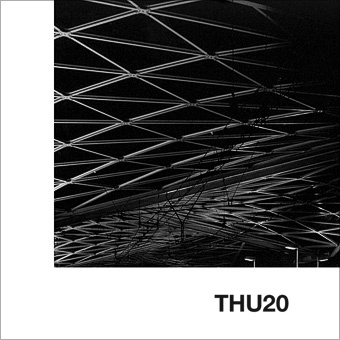 A small selection of live recordings by THU20 has been made avialable before, such as a split LP with Merzbow, and live recordings from Nancy. 'Tilburg' fits that particular line of THU20 work. Various recordings were made, from the P.A. aswell as by the individual players, which were slightly edited by THU20. Cover by Meeuw. The first release in six years by this Dutch quintet, comprising Jos Smolders and Roel Meelkop on laptops, Peter Duimelinks and Frans de Waard on 'acoustic objects' and the analogue electronics of Jacques van Bussel. This is a long-running if irregularly convening group, whose discography stretches back to the mid-80s and whose line-up has evolved over time. With the exception of van Bussel, all involved in its present formation have worked together in a number of different groupings and collaborations. Tilburg is a live recording, which is probably not the best way to hear THU20, given the number of sounds they're generating and the complexity of the process by which they're layered. Its first side takes a bell curve form. As the activity level rises and the density of the playing increases, much of the detail gets smothered by electronic fuzz, through which discrete sounds struggle to penetrate. The second is better ? clearer and more volatile. There's less going on, individual sounds shift to the fore, and each of the contributors' individual sounds are more clearly discernible.